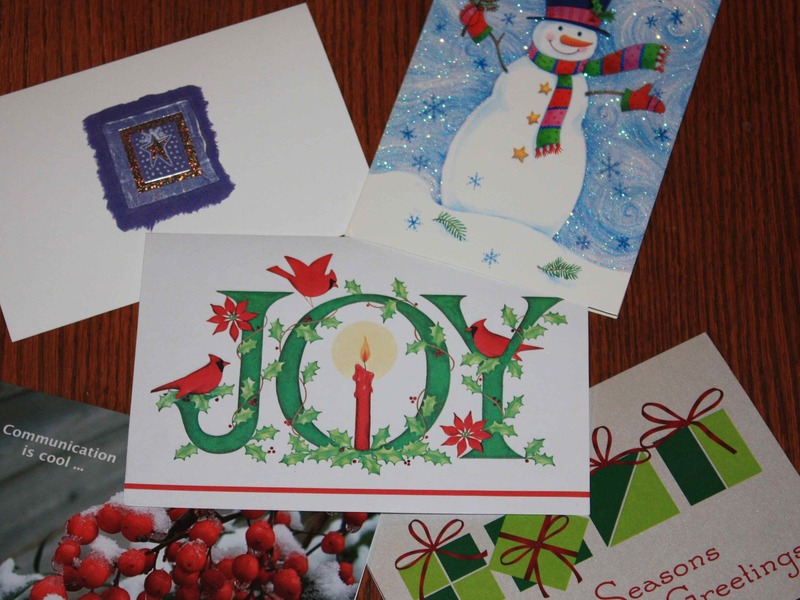 Christmas cards are the old social media – of the printing press era. But they say something to us about the new social media – our current interactive networks. Personally, I love sending and receiving greetings this time of year. It’s a chance to touch old friends and colleagues with a personal wish of peace and well-being. I even like reading Christmas letters of faraway friends for news of their families and work lives. Relationships are built by communicating with people, repeatedly, often in different ways, over time. A Christmas card may be one touch. An email note or “retweet” on Twitter another. A phone call or one-on-one even better. Social media are like Christmas cards. To play, you have to commit time and resources. You can’t say we’re going to do interactive media and then not put in the time – it’s like intending to send Christmas cards, but never getting to it. Personal messages, even short ones, speak volumes. Just as the seasonal card is about letting someone know you’re thinking of them, any note or call tells an investor (or in-house colleague, for that matter) that you care. So now’s the time to start on “social media” for 2010, whether your plan is to tweet your earnings, blog your strategy, engage in online conversations on your industry, upgrade your website, or just touch more people personally in the new year. Oh, by the way, if you celebrate Christmas – Merry Christmas! If it’s a different holiday, best wishes in this beautiful season and all the best for the new year! Sooner or later something blows up for every company, so every investor relations professional ought to consider crisis communication as a critical skill. We should be in training. Two business professors offer a pretty good primer in “Let the Response Fit the Scandal” in the December 2009 issue of Harvard Business Review. In the article, Alice Tybout of Northwestern University and Michelle Roehm of Wake Forest focus on the response of management – specifically CEOs – to reputational crises. But their guidance also fits corporate staffers and others who offer counsel. These are familiar, common sense steps, but the important thing is that a company must execute well on all four stages of crisis response – or risk losing brand loyalty and value for years rather than weeks – say Tybout and Roehm. The profs have a couple of suggestions specific to communication in a crisis. If management concludes that the company is likely to be affected by a scandal, it should immediately acknowledge the problem, expressing concern for any parties harmed and outlining the steps the firm is taking to investigate and prevent further damage. Details aren’t appropriate in early communications, the profs say. In Step 2 the company expresses concern and describes initial actions – how it’s investigating the issue and what it’s doing to contain the problem from spreading. This is about management saying we know a problem exists and we’re on top of it. That quick “acknowledgement” to the public buys a little bit of time for the company to determine the facts and formulate a comprehensive response. At that point, the company communicates more fully what went wrong and how it is responding to correct the problem. And this is the plan for how the brand will bounce back, and value will be protected or restored for investors – which is what we’re in business to do. This weekend’s Wall Street Journal has a readable piece on what Warren Buffett didn’t invest in during the financial and economic crisis (“In Year of Living Dangerously, Buffett Looked ‘Into the Abyss'”) … Bear Stearns, Lehman Brothers, AIG, Wachovia, Freddie Mac and others. That night, in his offices in Omaha, Neb., Mr. Buffett pored over Lehman’s annual financial report. On the cover, he jotted down the numbers of pages where he found troubling information. When he was done, the cover was dotted with numbers. He didn’t bite. Six months later, Lehman filed for bankruptcy protection. So Buffett reads annual reports. Oh, I know, he’s a seventy-something sage, and many of us get most of our information online or on our phones. But Buffett is an investor with influence over market-moving sums of money. And apparently he digs into financial reports, marks them up and then makes his decisions. Not that a nice annual report would have saved Lehman or AIG. But in the normal course of investing, quality of disclosure and clarity of explanation do matter. Equity analysts have been shipping out from sell side firms on Wall Street and establishing their own independent analysis shops – in droves – according to “Research Renegades” in the November 2009 Bloomberg Markets magazine. The ongoing transformation of the sell side – through the financial crisis, the bear market and assorted tribulations still taking shape in Washington – is a big change that calls for investor relations professionals to flex with the times. If we are to connect with our companies’ audiences in the investment markets, we must pay close attention to boutiques and independent analysis firms, as well as the old-line brokerage houses that have traditionally provided research coverage. The number of independent research firms in the U.S. has soared to 2,667 from 1,012 in 2006, according to Integrity Research Associates LLC., a New York-based consulting firm. The article notes that traditional investment banks (mostly) aren’t going away. Their underwriting and ability to allocate securities offerings undergird relationships with institutional clients. The buy side sends 70% of commission dollars to giant firms, and only 3% to the independents, according to Bloomberg. “There is a symbiotic relationship between the bulge-bracket bank and the typical institutional investor, and I can’t see that being displaced,” [Jay Bennett, a consultant with Greenwich Associates] says. Yet many sell side analysts are departing, starting up their own shops or joining small firms. The article focuses on analysts leaving to avoid conflicts of interest at investment banks, but the broader Wall Street meltdown and dearth of offerings in the past couple of years must also be contributing to the exodus. Economics trump philosophical purity in most job moves on Wall Street (or elsewhere). What’s your experience with independents? Any ideas to share with IR colleagues?